To evaluate A3Support-Asthma during prospective trial at CHEO. Asthma exacerbations are one of most common reasons for children to be brought to the ED. Management guidelines are aimed at identifying three levels of attack severity: mild, moderate, and severe. Thus, early identification of the severity of an asthma exacerbation has implications for the child's management that includes repeated bronchodilator treatments, along with systemic corticosteroids for most patients; and additional adjuncts combined with ventilatory support for very severe cases. Patients with a mild attack are usually discharged home following a brief course of treatment (less than 4 hours) and resolution of symptoms, patients with a moderate attack receive more aggressive treatment over an extended observation in the ED (up to 12 hours), and patients with a severe attack receive maximal therapy before ultimately being transferred to an in-patient hospital bed for ongoing treatment (after about 16 hours in the ED). Predicting severity of asthma exacerbation early in ED management (at 2 hour mark) is difficult due to a limited amount of clinical information that can be used. During the patient management process, all members of the ED team (triage nurse, registration clerk, nurses, and EP) record patient information in the patient's chart as part of the EHR. Decisions are based on the information stored and retrieved from multiple sources, such as the EHR of prior visits, results from the laboratory information system (LIS), vital signs from VSM, and published evidence from on-line searches (e.g., PUBMED). Moreover, in order to follow the clinical pathway, caregivers interact with several internal systems to place laboratory requests and suggested treatment using the computer physician order entry (CPOE), evaluate bed availability using ADT system, and prepare disposition information using EHR. The necessity to switch between different systems combined with the requirement to constantly monitor the patient's state, introduces additional burden that may eventually lead to a critical mass problem, where the user will not be able to navigate between specific computer systems to complete routine tasks. Information agents - providing access to heterogeneous information sources (databases, knowledge bases and external information systems). A3Support interfaces with all clinical systems (EHR, CPOE, LIS, ADT) and monitors (VSM) that are used by the caregivers during the entire patient management process from initial triage through the disposition decision. Following the evidence-based principles, the caregivers rely not only on clinical information, but also use evidence-based medical knowledge that includes practice guidelines, clinical pathways, drug reference manuals and past cases stored in the clinical evidence repository (CER). A3SupportAll systems, monitors and the clinical evidence repository (ADT, CPOE, EHR, LIS and VSM) are assigned appropriate information agents that provide access to stored and monitored information. Moreover, the access to EHR is further controlled by the "lock box" task agent that filters requested and provided information according to the lock box (the limits that patients can place on the use and disclosure of their personal health information). A3Support includes around four interface agents specific for each type of caregiver and the tasks they complete: the triage nurse interface agent for triage assessments, the registration clerk interface agent for registration interviews, the nurse interface agent for clinical assessments and completion of physician orders, and finally the EP interface agent for the EP evaluation, as well as treatment and disposition decision-making. Nurse and EP interface agents interact with the security and authorization agent that ensures that only authorized users can access the DSS and that they they use the DSS in authorized way (e.g., according to their responsibilities). All task agents work autonomously, thus there is no need to plan their cooperation. 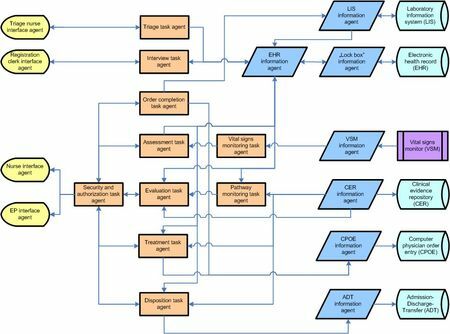 The user of the clinical DSS plays the role of a "super-agent" that controls the management process, passes requests to specific task agents through corresponding interface agents and is presented with the results.